This CogSci workshop brought together human interaction researchers, artists, photographers and designers to explore the conceptual and practical methods they use to create informative representations of human interaction. There is a nice write-up of the workshop by Susan Malaika and a repository of images and tweets about the workshop on the #tfaocogsci2017 twitter hashtag. identify historical trends in our formal and informal ideas about the nature of human communication. Participants will be asked to engage in a series of practical workshop activities and discussions that will explore their approaches to this issue. We invite you to participate in a month-long pre-workshop discussion (starting on the 26th June) on our Pinterest board, a social network for sharing images and video that will serve as a starting point for workshop discussions. The workshop will also take advantage of London’s thriving museum and gallery sector, so after the workshop we will go out for ongoing discussions at a nearby series of gallery exhibitions, followed by an informal dinner. 10-10.30am: Overview presentation by the workshop organisers. 10.30-11am: Attendees introduce themselves and say something about their images, the representational problem they are bringing to the workshop, and whatever other questions have arisen during the pre-workshop image sharing. 11.15-12.30am: Break-out groups session 1, including a feedback session. 2.30-3.45pm: Break-out groups session 2, including a feedback session. 3.45: Depart for National Gallery visit. 3:45-4:30: Peripatetic plenary on the way to the National Gallery. 4:30-6pm: National Gallery interactional exhibits tour & discussion, followed by drinks/restaurant visit. If you would like to participate, please register for the workshop at the CogSci website. If you cannot afford the $30 day-registration fee, please get in touch. http://www.cognitivesciencesociety.org/conference/cogsci2017/workshops/. There are some pre-workshop activities we would like you to participate in. 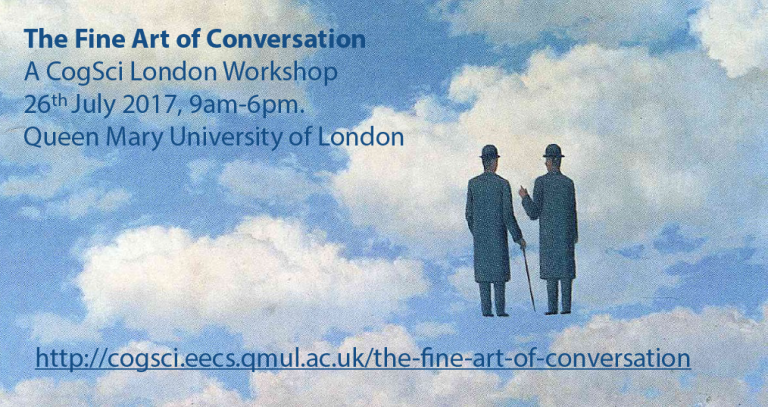 Please register and contribute to the Fine Art of Conversation Pinterest. We ask you to submit artworks, photographs or data excerpts that are inspiring, interesting or puzzling to you in terms of how they represent human interaction. We will use these to start conversations at the workshop. For help using Pinterest for desktop browsers, iOS or Android, please contact us. If you would like to present some work in progress or new ideas, and involve participants in a 40 minute workshop session, please let us know. You may propose this spontaneously on the day, but if you require us art materials or any special equipment for this, please contact us. Please email any of the co-organizers with questions or ideas for the day.